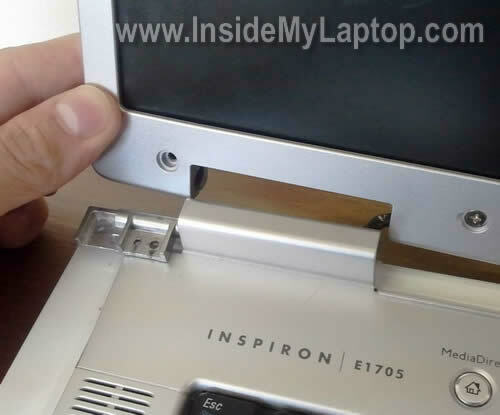 In this guide I explain how to fix damaged display hinge in a Dell Inspiron E1705 laptop. 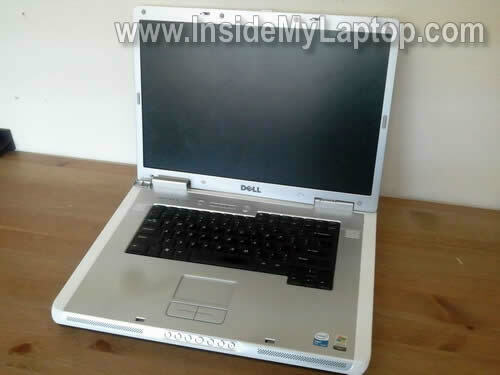 This guide also works for Inspiron 9400. Today one of my customers brought me a Dell Inspiron E1705 with the display completely separated from the base on the left side. At first I though the hinge was broken, the display cover damaged and needs an expensive repair but later I found the damage wasn’t that bad. First of all, I removed the display bezel. 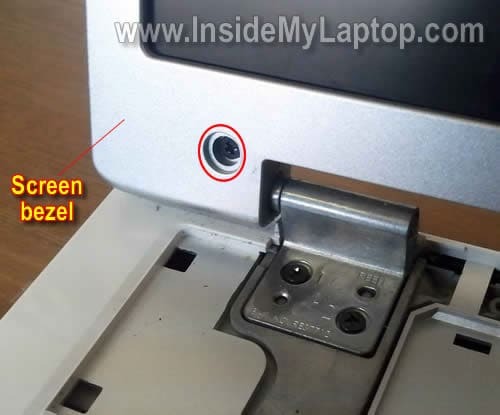 You’ll find step-by-step bezel removal instructions in this disassembly guide. After the bezel was removed, I was able to take a closer look at the damage and… i didn’t find any! 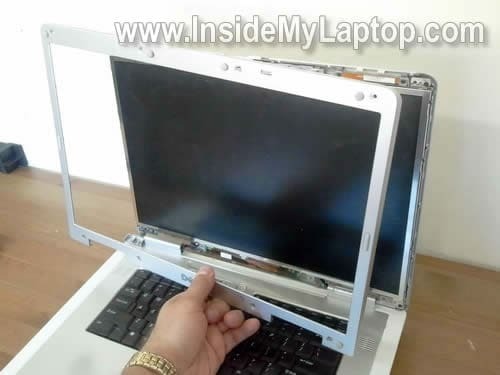 The hinge wasn’t broken and the display cover was in a good shape too. Apparently, the screws got loose and fell off. Because of that the hinge separated from the cover. I was able to rotate the hinge into normal position with a small screwdriver. 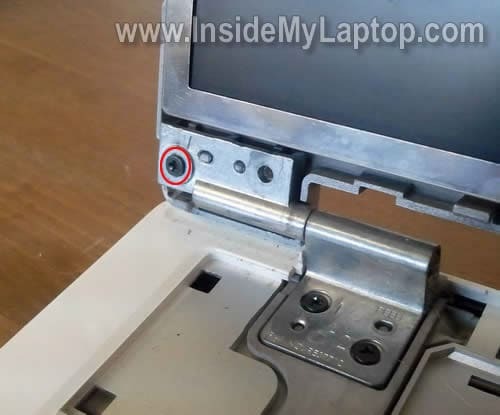 I decided to remove the power button cover to tighten hinge screws on the laptop frame. I explained how to remove the power button cover in another post. As I expected, both screws were loose. After that I connected the display panel back to the hinge and secured it with one screw (M2.5×5 mm). I examined the video cable very closely and didn’t find any damage. 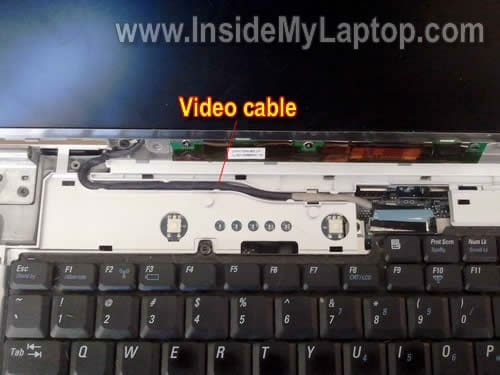 Make sure the video cable is routed correctly, as it shown on the picture below. At the next step I attached the screen bezel back to the display. Finally, I covered all display screws with rubber cups and installed the power button cover. thanks for the writeup!! i used it along with others on the E1705 to perform a few repairs. Thanks so much for this! Saved a ton of headaches!! Just wanted to say a thanks here! Recently the left side screen hinge on my e1705 broke, almost wanted to just say heck with it and get a new computer as its 4 years or so old anyways. But thanks to this i realized its a fairly easy fix and way cheaper to stick with what i got. 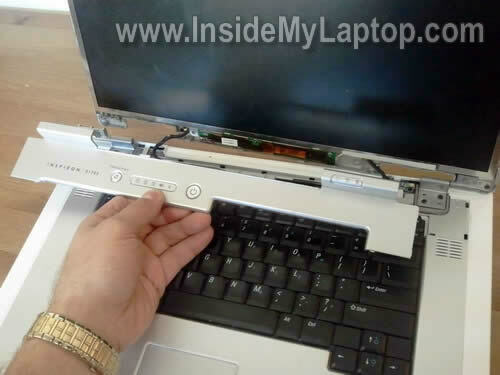 hi i am trying to fix my daughters dell inspiron and bought new hinges. it might not be hinges. the right hinge keeps popping cover up and will not work properly any suggestions.? help mother trying to save daughters computer. and thank you for all your articles, they are great. 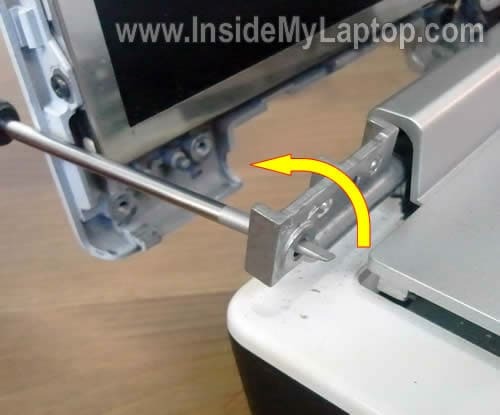 It’s possible your original hinge is not damaged but loose. 1. Remove the keyboard cover as it shown on the 6th picture. 2. Check screws securing the hinge. Screws shown on the 7th picture. I think your screws are missing and you can fix the hinge if you install them back. 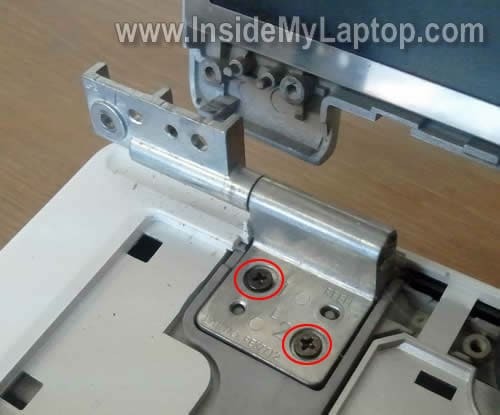 I encountered the same problem with my DELL E1705 and purchased some replacement hinges. However I’m having a problem attaching them as both the hinges are in a “locked” position and I can’t seem to “unlock” them. This is what lead to my problem with the hinges in the first place. The left hinge became “locked”, under the bezel, causing the bezel to start to crack as I moved the screen back and forth and the right bezel just cracked. 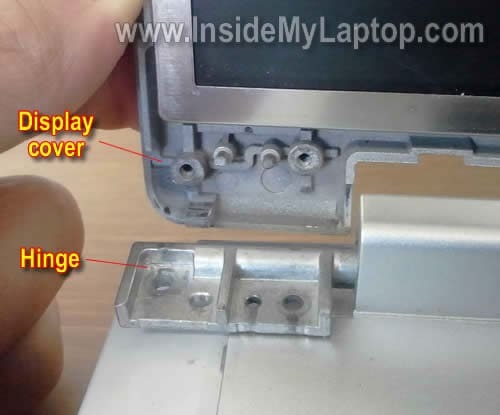 Also when the original left hinge locked up, a screw ended up breaking off in the left Display cover hole (the same one indicated in picture 4). Any ideas on how I can fix these problems? Thanks you saved me buying a new laptop as was ready to ditch this one! But realised how easy this was to fix and is now as good as new!! Worked like a charm, thank you so much, I thought the hinge was broken and it was just a simple screw. You saved me a ton of money having to not send it out for repair. I have a Inspiron E1705. Thanks!! Where does one purchase the rubber screw hole covers for the display bezel?